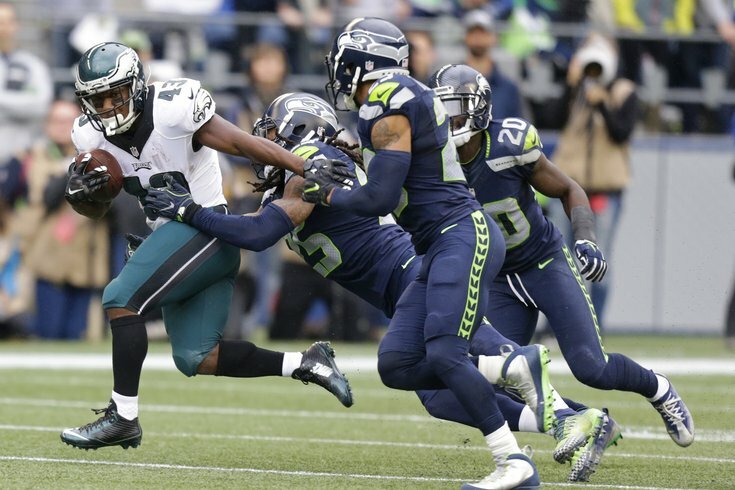 Philadelphia Eagles running back Darren Sproles tries to avoid a tackle by Seattle Seahawks cornerback Richard Sherman, second from left. The Eagles will be forced to finish their game against the Seahawks without two of their most productive offensive weapons. Running backs Darren Sproles (ribs), arguably the team's best pass catcher and an important safety valve for rookie Carson Wentz, and Ryan Mathews (knee), who leads the team in carries and touchdowns, both went to the locker room in the first half after sustaining injuries and did not return for the second half after being ruled out for the remainder of the game. That leaves rookie fifth-round pick Wendell Smallwood and Kenjon Barner as the two running backs the rest of the way. Moreover, it means Sproles, who was injured on a punt return late in the second quarter, will not be available to return punts. Instead, that job will belong to Barner, at least for the rest of the day. Left tackle Jason Peters went for X-rays on his forearm in the first half, but he returned to the game. Defensive end Connor Barwin appeared to injure his knee in the third quarter, but he returned the following series. Cornerback Leodis McKelvin went to the locker room just after the end of the third quarter. We'll have more on his injury as it becomes available.